The “doc” explains that there are two gliadin remnants leftover after enzymes from your pancreas hopefully took care of the rest. The problem we have here is that the intestines do not have the enzymes to break them down further. 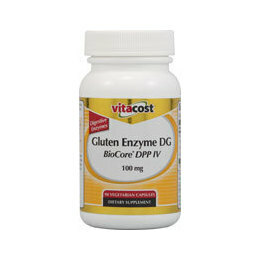 However, there are 2 fungal-derived enzymes that have been shown to break down the gliadin remnants: dipeptidyl peptidase IV (DPP IV) and prolyl endopeptidase (PEP) (now, in its current version, Prolyl endoprotease). 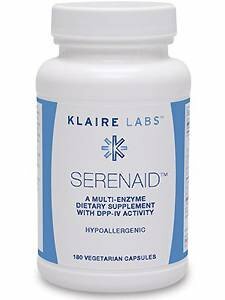 Poking around a little further, I came across an article from Klaire Labs and found the DDP IV’s supplement’s proper name, SerenAid. The two recent reviews on Amazon.com looked promising. As I searched a little more I realized we are still in the trial stages of these supplements. It is not recommended to take the pill and then go eat a pizza. For now, it looks as if these might be a great thing to have on hand if you are going out to eat or you just accidentally ingested gluten. As of now, I’ll stick to my diet. I’m not saying to go out and buy them, but have you ever heard of or tried them? A moderator on Celiac.com recently commented after attending the International Celiac Disease Symposium, that a doctor said the proper breakdown should be occurring in the stomach, not the intestine, and that we are still a few years off. If you are interested in adding enzymes to your cocktail, be sure to make sure they are wheat and dairy free!